Is there a wrong way to enjoy beer? 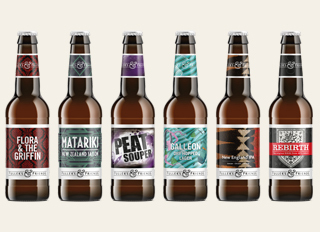 The innovative six pack of collaboration beers has a beer to suit every palate. Brewed between Fuller’s and six of our favourite regional brewers, the box set is the perfect way to sit down with friends and enjoy beer at its finest. In a recent post, we gave you a rundown of the beers in the Fuller's & Friends box set, as well as more information on the brewers we invited to Chiswick to create them. At the first night of the launch tour, here in the world-famous Griffin Brewery, Head Brewer George Young led a tasting session. Going from the lighter to the darker beers, our team agreed that this was the best way to enjoy the aroma and taste of each beer. But do you agree? And do you have a favourite? Fancy paying us a visit? Find your nearest Fuller's pub.